Home » Pregnancy & Breastfeeding » Do Postpartum Belly Bands Work? Do postpartum belly bands work to help you lose weight after birth? I put them to the test! Do you ever feel like Facebook is stalking you? 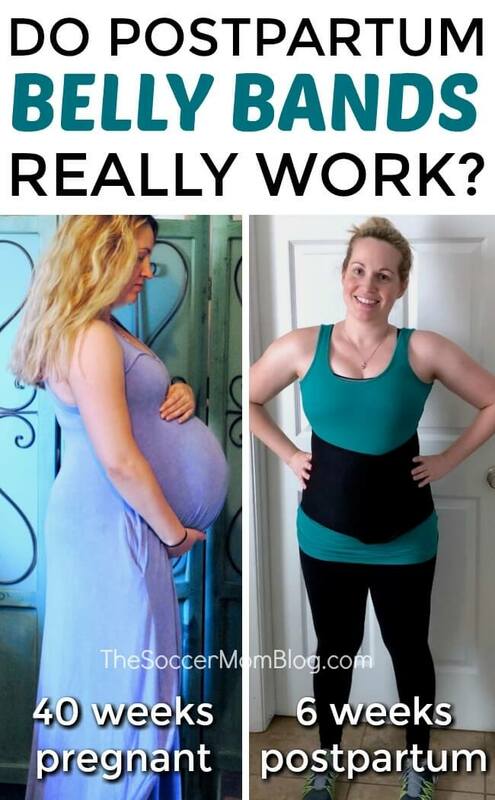 When I was pregnant this past year, I always saw tons of ads featuring celebrities, bloggers, and “real moms” wearing belly bands to help lose weight after giving birth. If you click on one, then you see hundreds more (thanks Facebook). I’ll admit I was curious. I mean, the before and after photos are often pretty incredible. But obviously I was skeptical too. Could using postpartum wraps actually make your belly shrink faster? 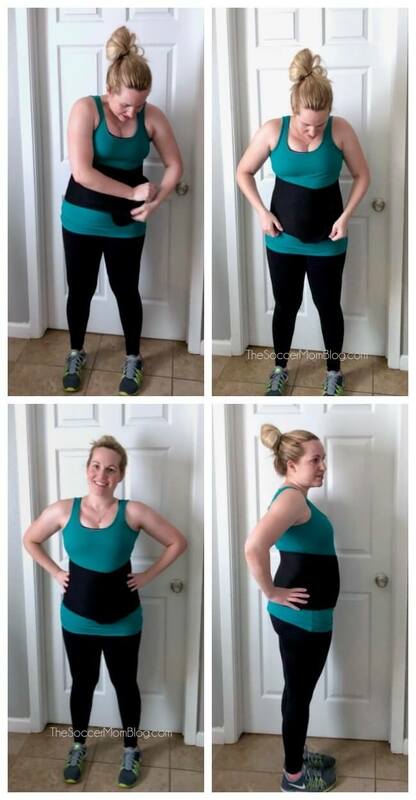 I didn’t use a belly band with my first pregnancy, and it took me a while to lose the baby weight. Plus, my recovery (I had a c-section) was long and grueling. Whether you call it a belly band, belly wrap, compression wrap, abdominal binder, belly binder, etc. — the concept is essentially the same. Belly bands work by gently wrapping around your midsection and compressing everything inward. They also provide support for your back and core as you heal. The supportive aspect of belly bands was just as appealing to me as the possibility of losing inches from my waistline. After birth your stomach kind of deflates, and you’re left with this jiggly pouch. It feels heavy and awkward. Also, since you have no core strength it is common to over-compensate with your back when you move around. This can lead to some pretty gnarly back pain in those first few weeks! My hope was that my belly band would keep the jiggle contained, protect my incision, and provide back support while my stomach healed. TIP: Belly bands are a little bit different than corsets, which create more aggressive compression. Corsets are not usually recommended after giving birth. When choosing a belly band, look for one that is made of soft, stretchy material with an elastic closure that can be adjusted as your body changes shape. When Should You Start Wearing Your Belly Band? From both my research and personal experience, you’ll get the maximum benefits of postpartum compression in the first 4-6 weeks after birth. If you had a normal vaginal birth with no complications, you can start wearing a belly band or wrap right away. If you had a c-section (like me), you’ll want to wait until your incision is sufficiently healed. For me this was about 2 weeks postpartum. I’ve seen other c-section mamas who said they started wearing their belly bands after only a couple days, but my incision was still very tender at that point. Some companies recommend wearing their bands 24 hours a day, though I only wore mine during waking hours. It wasn’t very comfortable to sleep in, so I gave myself a break at night. Here’s what you really want to know…did a postpartum belly band work for me?? What belly band did I wear and how often did I wear it? First, I want to make it very clear that I was not compensated for this review, nor did I work with Belly Bandit brand in any way. This is simply the postpartum wrap that I chose on my own and I’m sharing in case you want to try it too. (I provided shop-able links on Amazon which is where I ordered mine). I chose the Belly Bandit “Viscose from Bamboo” wrap in a size medium. I made my decision based on reading product descriptions and reviews. The Belly Bandit bamboo wrap can be used after a c-section (which I had) and is covered in a soft viscose material for extra comfort. PROS: The Belly Bandit “Viscose from Bamboo” wrap is very soft on the outside, which made it comfortable to wear (though I usually wore a camisole underneath to keep the wrap clean). The elastic closure is easy to use and stays put. The wrap is very durable, and I feel like it would last through multiple pregnancies if you wanted to use it again or gift to a friend. CONS: The wrap does ride up a little bit when you sit down, though that could be due to my short torso. Click here to purchase the Belly Bandit Viscose from Bamboo postpartum wrap on Amazon. When choosing a size, be sure to follow the manufacturer’s recommendations. I am a size small in every type of maternity clothing, yet Belly Bandit’s website said I should order a medium. I was skeptical, so I ordered the small….and it did not stretch all the way around my belly. Whoops! I ended up having to re-order a medium (I kept the small in case I needed it later). How Long Do You Wear a Belly Band? As I mentioned above, I started using my Belly Bandit at 2 weeks postpartum and continued until 6 weeks postpartum. My midwife told me it was time to stop wearing it after my 6-week followup appointment. That way my muscles could rebuild faster without relying on the band. My belly didn’t seem to budge at all for the first two weeks after birth, but as soon as I started compression, I lost over two full inches in the first week alone. This is without diet or exercise, as I wasn’t cleared to start working out until about 7 weeks postpartum due to my surgery. Overall using a belly wrap for one month I lost 5 inches, which made a noticeable difference! In fact, I had quite a few friends and family tell me at that point that I didn’t look like I recently had a baby. Compared to my previous pregnancy (with no belly compression), I feel like my belly started shrinking much quicker. I did eventually lose all the baby weight last time, but it took almost a full year of HARD work. Related: Read how I lost weight while breastfeeding here! Does a Belly Band Help You Lose Weight? During the first six weeks after I gave birth I lost 28 pounds (out of about 45). This seems like it was a lot faster then after my last pregnancy, though I can’t remember exactly how much I lost in the first 6 weeks last time. What I do remember is that I felt like my belly was still huge and jiggly until I was able to start exercising at 8 weeks PP. A belly band won’t necessarily make you lose weight, but if it helps you feel more supported so you’re able to be more active, then that combination could help with weight loss. 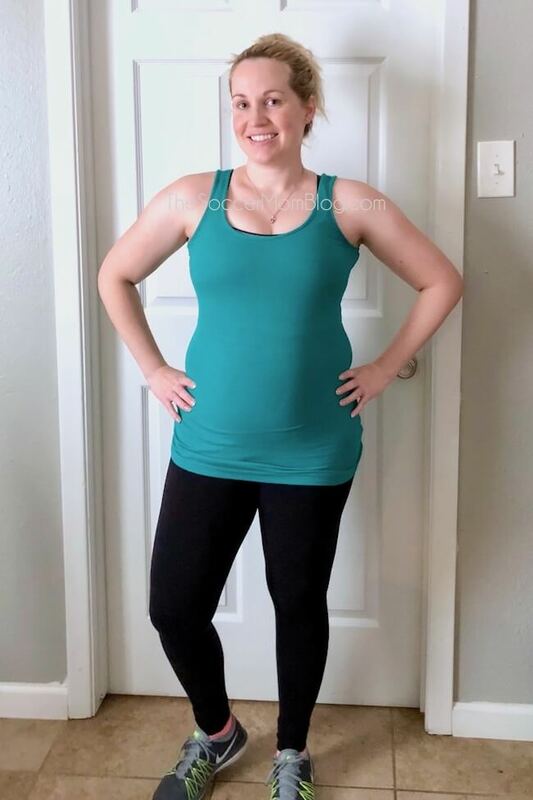 Wearing a belly band allowed me to feel comfortable and secure when I was up and about, so I was able to start taking walks 3-4 weeks after surgery (compared to 8 weeks after my last pregnancy). I definitely think that my increased activity level helped me heal faster and lose weight faster. TIP: Don’t push it with exercise right after birth. Your body needs time to recover after such a huge event and you deserve it too! Walking is the best way to get started, but wait for your doctor or midwife to clear you for anything beyond that. There’s no rush to get all the weight off and if you hurt yourself it will take longer. I still have about 1/3 of my total baby weight left to lose, but I think that wearing a belly band helped kickstart my weight loss and my body heading back towards normal. A belly band won’t do all the work for you. At some point (when your doctor give the ok) you’ll need to start exercising. Eating nutritious, real food (I don’t diet) is key too. However, I am super happy with my results after using the Belly Bandit Bamboo wrap for one month! I still have a little belly, but I’m ok with that for now. I did just create another human being not too long ago! The photo below is what things look like at 6 weeks postpartum, after using a belly band for one month. No photoshop, no filters, no special angles! Definitely not back to my pre-baby shape, but that’s ok! I’m happy with where I’ve gotten and trying to be patient with the process. Disclaimer: This post is based on my own personal experience; your results may vary. Belly wrapping and compression should be avoided if you have any signs of infection or experienced pregnancy/delivery complications like preeclampsia or anmionitis. Check with your doctor or midwife before wearing a belly band.